Of all the world's reefs, the coral in the northern Red Sea is particularly resilient to temperature change and ocean acidification. These corals have even been touted as likeliest to be the "last standing" while the rest succumb to climate change. However Israeli and Floridian scientists reported Wednesday in Marine Pollution Bulletin that pollution on top of global warming is too much even for this sturdy coral. Again, the researchers showed that northern Red Sea coral can handle "mere" climate change, as they and scientists in Saudi Arabia had shown before. But add nitrate and phosphate, coming from sewage, fertilizer runoff from farmland, and fish farm effluent, and the coral get sick. Not only do the coral lose their ability to ignore rising water temperatures: the nitrate and phosphate are like fertilizer for algae, whose explosive growth could kill off the coral once and for all, explains the research supervisor, Prof. Maoz Fine of Bar-Ilan University. The northern Red Sea coral apparently became tough because over generations, naturally intense fluctuations of temperature and other conditions in the narrow sea killed off the weaklings, leaving only the toughest still standing. But everything has limits, warn the scientists from Bar-Ilan University, the University of Mississippi and the Mote Marine Laboratory of Florida. Elsewhere, as ocean surface temperatures rise, reefs have been dying. About 50 percent worldwide are thought to be in serious danger. An early sign of trouble is bleaching. The colorful reefs we see consist not of one life form, but of two. Primordially, corals were independent one-celled cnidarians that formed colonies. At some point, apparently over 200 million years ago, when dinosaurs were young, coral became embroiled in a symbiotic relationship with algal cells. The coral protects the algae, and the photosynthesizing algae feeds the coral with carbohydrates. The algae are also responsible for the coral's colors. Coral also eat microscopic water beasties with their microscopic mouths, but they dote on nutrition from algae. Without it, they slowly starve. Yet when the water becomes too warm (or cold! ), the stressed coral expels its algal friends, and goes white – hence the term bleaching. Bleached coral isn't dead, at least not immediately, but it isn't happy. It can recover, if conditions allow. To be clear: the algae that flourish in filthy seawater are not the kind that cohabits with coral. And while scientists have newly identified the problem, protecting the reefs is going to be a big problem, they acknowledge. The potential for pollution is enormous and solutions do not leap to the eye. At least the Red Sea coral is spared concentrated feces from fish-farming, a huge source of "excess nutrients" in other coastal waters. The Jordanians have so far eschewed fish farming in the gulf because it is environmentally foolish. Israel did have fish farms in the Gulf of Aqaba until 2008, Fine tells Haaretz: they were abolished because of the ecological damage they caused. Apparently Israel is now thinking of building inland fish farms, fed with seawater. Fine deplores the idea on the grounds that the "used" seawater would be returned to the sea, which is just asking for trouble. Sunscreen used on beaches is also deadly: separate research from 2015 found that even tiny amounts in the water poison coral. Eilat and Aqaba both abound with sunscreen-slathered swimmers. Then there are the flash floods. One would think that occasional flooding in the deserts around the Red Sea has been a norm for eons, and indeed it has been. But Fine points out that the flooding has become worse because of climate change and mainly, because of us. Thanks to urbanization and paving the coastal areas, more freshwater is reaching the sea, bringing with it detergents, pesticides, and diverse gook washed off from roads, towns, and industrial zones. Technically the scientists tested the corals' ability to withstand environmental stresses using corals incubated in 80 aquariums emulating the Red Sea, where they monkeyed with the conditions to see how the coral would react. 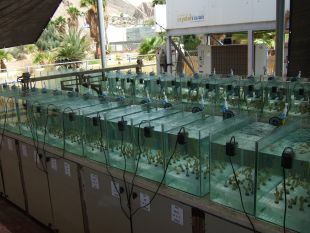 The coral did fine with higher temperatures, and acidification – but packed in the towel when nutrients such as nitrate and phosphate were added. The corals lost much of their resistance to thermal stress, says Dr. Emily Hall of the Mote Marine Laboratory and lead author of the study. The nutrients also changed the entire microbial community on the coral surface: there were differences in bacteria, archaea (formerly known as archaebacteria), micro-algae, the lot. 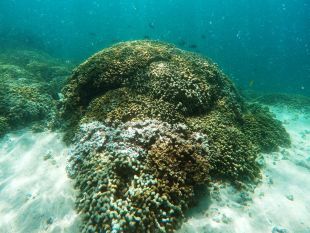 "When we see a shift in the microbial community it is cause for concern because this can lead to coral diseases, just like in the human body, where change in the microbial community can lead to sickness," Hall said. Why do we need coral, anyway, except that it's pretty? The answer boils down to biodiversity. The more diversity there is, the more likely that somebody will survive catastrophe. 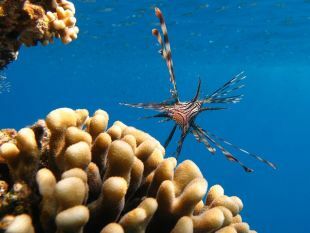 Reefs are hotspots of biodiversity. The long and short is that the north Red Sea coral can hold out as temperatures climb, to some degree. It's the other stuff that will kill it: the rising CO2 in the water which helps algae, the increase in flash flooding, and our waste, delivered to the waters in myriad forms. And our obsession with sunscreen. Saving the coral means halting coastal development and eliminating local disturbances, Maoz tells Haaretz. That's a bit of a tall order. Despite the rising ocean level, Israel, Jordan, Egypt and Saudi Arabia all plan further development along the Red Sea coastlines. If we're to rescue the coral, we have to somehow overcome the glaring geopolitical obstacle, and coordinate.